9 When he opened the fifth seal, I saw under the altar the souls of those who had been slain because of the word of God and the testimony they had maintained. 10 They called out in a loud voice, “How long, Sovereign Lord, holy and true, until you judge the inhabitants of the earth and avenge our blood?” 11 Then each of them was given a white robe, and they were told to wait a little longer, until the number of their fellow-servants and brothers who were to be killed as they had been was completed. I imagine heaven to be filled with light, from God Himself. Angels. Souls ascending through the “Sea of glass” (see note below). 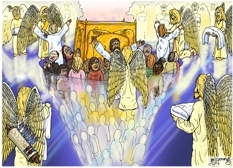 This was quite a challenging scene to draw, as I wondered how to draw souls underneath the altar in heaven. I decided to have the souls ascending through the “Sea of glass” which is before the throne in heaven. In the background you can see the large gold altar, with four horns at the four corners. Smoke is rising from the altar. The souls beneath the altar which are further away (at the bottom of the scene) are quite indistinct and vague in shape, whereas those that have arrived at the base of the altar are much more defined and have clearer details. 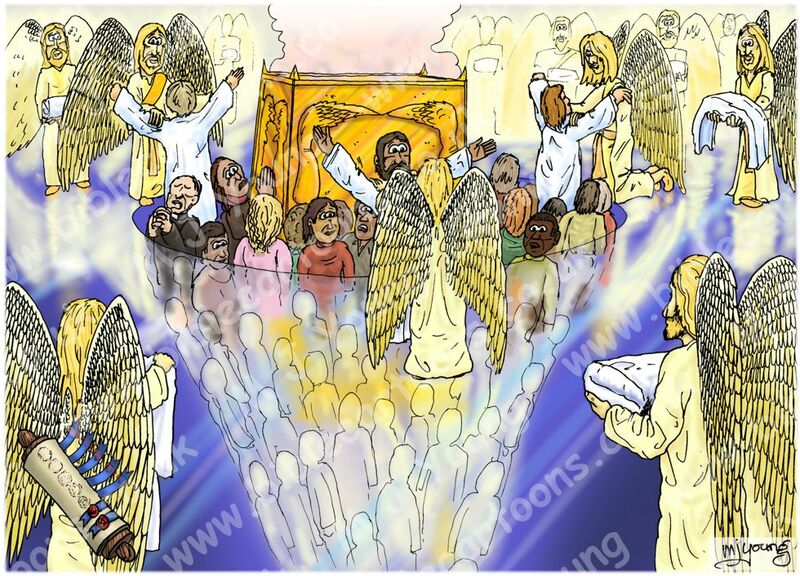 Angels are bringing white robes (verse 11) and helping the souls into them. (9-11) The fifth seal differs from the four earlier seals. It is not introduced by the voice of the living beings, and the cry “Come.” The voice which is now heard is not the cry of the groaning world, but of the oppressed and troubled Church. In the fourth seal the climax of world-sorrow seemed to be reached in the accumulation of war, famine, pestilence, and noisome beasts. It declared to the evangelist that there were evils which would continue and even increase in the world. “Ye shall hear of wars; nation shall rise against nation.” Social troubles, war, poverty, and privation would still exist; religious troubles, evil men and seducers would wax worse and worse. Worldly policy, selfishness, and the untamed passions of mankind would still trouble humanity. Then if such troubles and disorders remain, what has the Church been doing? Where is the promise of that early vision of victory? The answer is given in the fifth seal. The Church has been following her Lord. As the vision of Bethlehem and the angel-song of “peace on earth” passed, and made way for the agony of Gethsemane, the cross of Calvary, and the cry “My God, why hast Thou forsaken Me?” so the glowing dream of a quick conquest over all evil passes away, and the picture of an agonising, persecuted Church takes its place, and the voice of its anguish is heard, “How long, O Lord!” The Church has her Bethlehem, her Nazareth, her Gethsemane, her Calvary, her Easter morn; for Christ said, “Where I am there shall also My servant be” (John 12:26). The seals, then, are not merely visions of war, famine, &c., they are the tokens that the victory of Christ’s Church must, like her Lord’s, be a victory through apparent failure and certain death. The four seals proclaim her apparent failure; she has not brought peace and social and political harmony to the world. The fifth seal shows her suffering, the witness of the servants of Christ has been rejected; in the world they have tribulation (John 16:33).